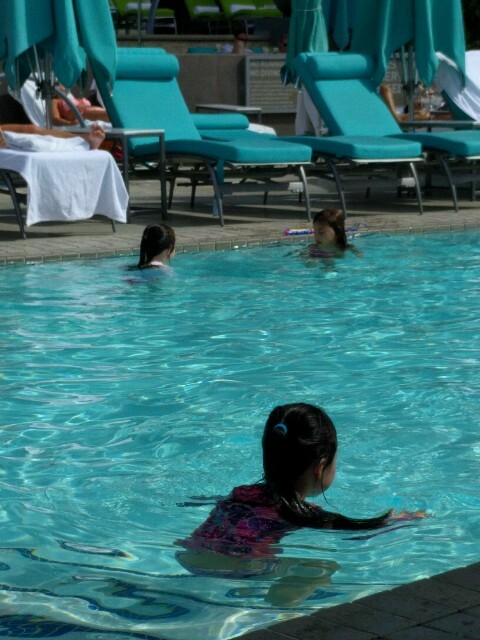 Day 5: This was the day Elizabeth had been dreaming of all of her traveling life – a morning at the hotel pool! I figured that the best time to go to the pool with a kiddo in Vegas was first thing in the morning. I hurried down to the Vdara cafe and brought back food to the room. I thought we had until about noon to enjoy the pool in a family-type atmosphere. We got there by 9am and there were plenty of chairs (with umbrellas!) for us melanin challenged people. My mom and I grabbed a set of seats near the edge of the shallow end. Within a half hour Elizabeth was lucky enough to meet a girl about her age. Elizabeth, the new friend and the friend’s younger sister played at the pool until noon. It couldn’t have worked out better. Sure enough, about 11:45 am the atmosphere started changing when bikini-clad girls and guys with aviator sunglasses showed up with drinks in hand. This was our cue to pack it up and head in. We ate a light lunch and then we all had a quick rest before heading out on our afternoon tour. My husband and I love Las Vegas. When we visited last year I made notes on what to see and what to avoid with Elizabeth. For example, I have a strict no walking on the Strip policy. There are people that hand out cards with scantily clad women on them, often excessive drunkenness (even by Vegas standards) and people dressed as showgirls. Not exactly the kind of Vegas I would like to show my seven-year-old. If you happen to find yourself in a situation like one of those I just mentioned, I advise pointing at something safe and large (like the Eiffel Tower at Paris) to distract long enough to escape. 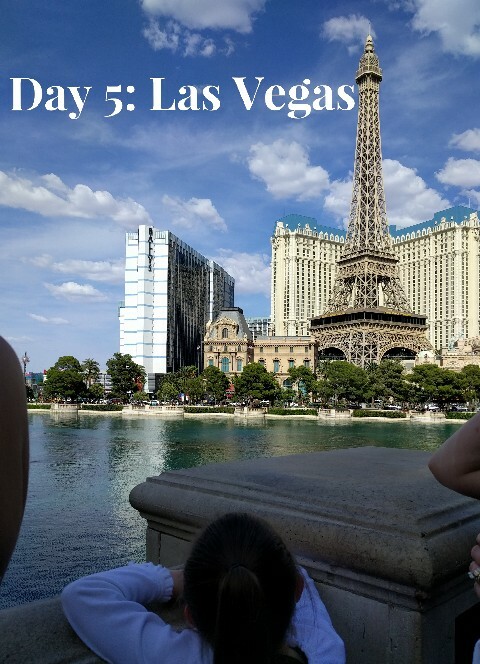 Vdara has a walking path to Bellagio so we used that to visit one of my favorite venues on the Strip. The first place we encountered was Jean Philippe Patisserie. I ordered a chocolate crepe for us to share. My mom and I loved it. Elizabeth was not a fan so she got two delicious chocolate covered strawberries instead. From there we walked the few steps down the hallway to the Bellagio conservatory. It has themes that change periodically through the year. It was an ocean theme this summer. 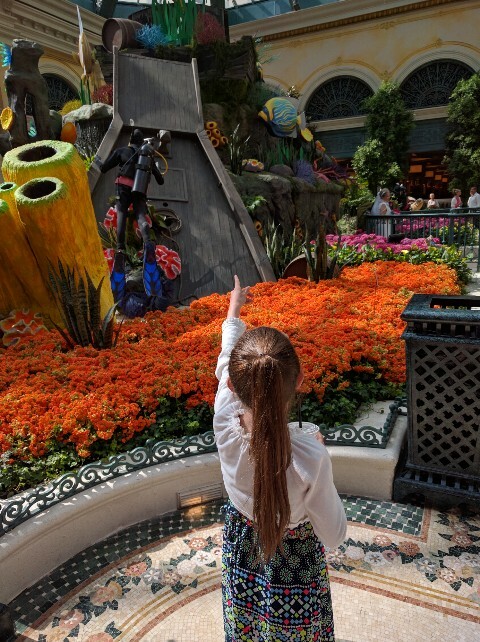 We loved walking around the conservatory admiring the flowers, decorations and aquarium. 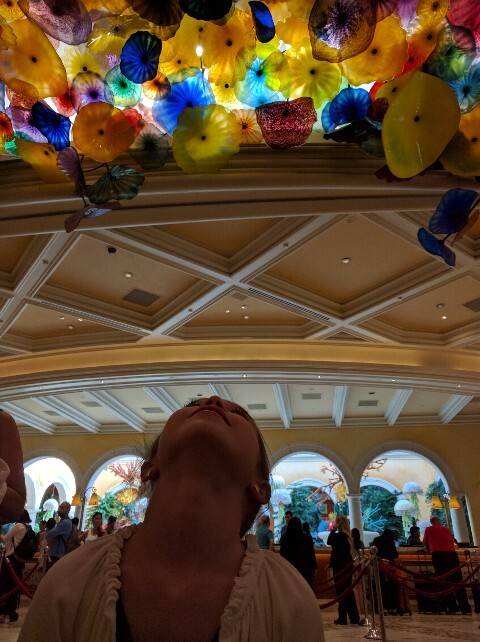 After leaving the conservatory we wandered through the lobby to admire the Chihuly glass flower ceiling. Last stop at Bellagio was the fountain. Because, really, thanks to Ocean’s Eleven that is what people think of when they think of Las Vegas. By this time we needed to grab a cab to MGM Grand. 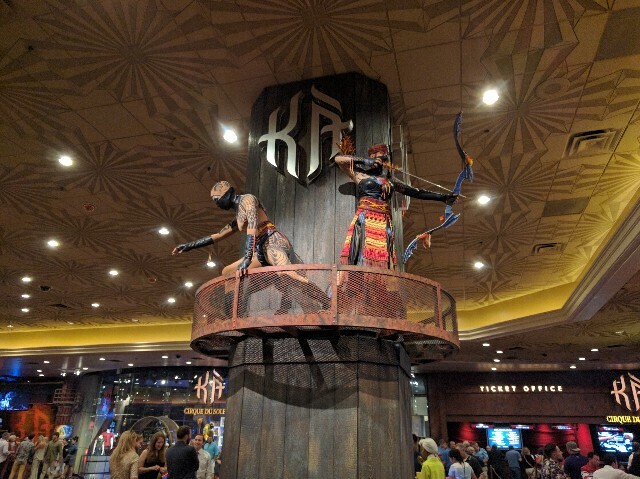 We had tickets for the 7pm Cirque du Soleil show Ká. Before the show, we had an early dinner at Crush in MGM Grand. We had a great meal (Elizabeth and I shared an entree) and my mom got an amazing pasta dish. There was nothing left on our plates! At the start of the show the actors are in character walking on top of theater partitions, calling out to each other, and they bring the story to life even before the performance begins. The ninety minutes flew by and the three of us were disappointed to see it end. Elizabeth was so amazed by the performance she didn’t want to leave MGM. When I realized how much she loved the show we went back to get a program (which is almost picture book in style) and take more pictures outside the theater. By now it was 9pm and the party people were heading out to the clubs. We waited in a super long cab line, but at least it moved fast. We had successfully survived Las Vegas! 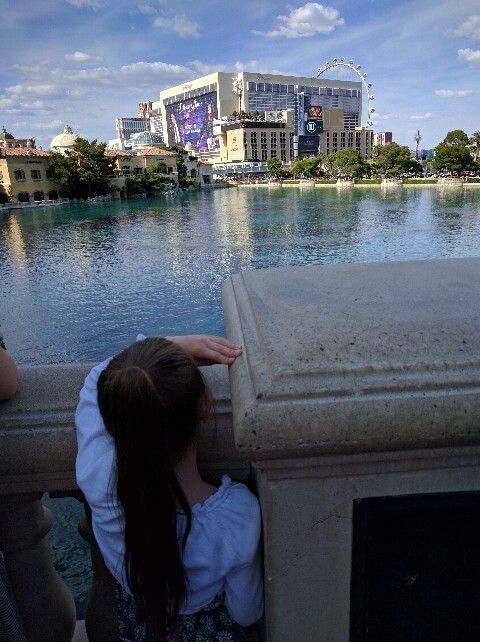 And not just survived, but I think Elizabeth finally fell in love with Las Vegas like her parents (at least a little).